Although they have aged only three years, they have been in space for 20; each man has become unkempt, lethargic and bored. Talby spends all his time in the dome staring at the stars and dreaming about the beauty of the Phoenix Asteroid, which is said to glow with colours; Doolittle was a good surfer back on Earth and misses his board more than anything; and Pinback reveals in his computer diaries that he is really Bill Fruge, a Fuel Maintenance Technician who just happened to try on the other man's suit. Boiler simply keeps his head down and gets on with his job, hoping for better things. However, a succession of events conspire to spiral out of control and they all go to hell in a handbasket. Communications Lazer No. 7 is damaged when the ship passes through an asteroid storm, causing Bomb 20 to exit its bay on two separate occasions. It is ordered back the first time by the men and subsequently persuaded by the ship's computer. Possessing an individual intelligent personality the Bomb becomes increasingly frustrated. When the crew comes to legitimately drop the bomb it will not release due to an accidental short circuit caused by the escaped alien (more of that in a moment). The countdown begins and, with only 14 minutes remaining, Doolittle visits the cryogenic unit to ask the advice of the dead Commander Powell. However, Powell is isolated and forgetful, so Doolittle is reduced to leaving the ship to argue the great questions of life with the bomb. The forgotten Talby is sucked out into space whilst examining the damaged lazer, resulting in a conclusion which borrows equally from Marvel Comics' The Silver Surfer and Ray Bradbury's Kaleidoscope. As a long-time admirer of John Carpenter's work, I could bore you within an inch of your life with a multitude of fascinating behind-the-scenes information. But rather than allow you to escape entirely you might be interested to know that he and Dan O'Bannon wrote the script whilst still at film school. The product took well over three years to complete, due to money and distribution problems, but still only cost $60,000. Wigs and false facial hairs were utilised to cover the changes to the actors' appearance over that time. Much of the work was produced by the duo themselves; whilst Carpenter wrote, scored, produced and directed, O'Bannon wrote, handled the film editing, production design and special effects supervision, as well as playing the part of Pinback. Yes, it looks a little cheap, but aside from the abundance of seventies hair it's not as dated as you might think. Special effects are kept to a minimum, and a sense of apathetic realism is generated by downplaying the acting. None of the characters become excited about anything that happens, even when their very lives are in danger; they are well past emotions and into paranoia. Anyone who has already seen this film will surely agree that, apart from the finale, the outstanding set piece scene is when Pinback goes to feed the alien. The beachball-like creature with webbed and clawed feet escapes the holding area and leads Pinback a merry dance through the ship and into the lift shaft where it almost succeeds in getting the man killed. You would have to be a fool not to realise this is a black comedy, but as the trailer on this disc proves Dark Star was incorrectly promoted as a straightforward science fiction action/thriller, inviting inevitable comparisons with 2001: A Space Odyssey when they are as different as chalk and cheese. 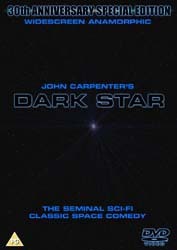 Dark Star was obviously a labour of love for Carpenter and O'Bannon. Deep belief in the product and its deserved niche in the marketplace sustained them through nearly four years of trying, when it might have been easier on several occasions to cut their losses and run. But after Carpenter's Academy Award for best short subject won for The Resurrection of Bronco Billy, he might well have gained a reputation as a failure with a short attention span. After all, how could he expect the film executives to have faith in him had he possessed no confidence in his own abilities? Instead of that, Carpenter earned much respect as a genius of the low-budget flick, going from strength to strength with Assault on Precinct 13, Halloween and Escape From New York. O'Bannon himself went on to script Alien and handle the on-screen graphics for Star Wars. Extras on this disc are sparse. As well as the original theatrical release of the film and the 1974 extended film version (which contains only a couple of additional scenes), there are bibliographies for John Carpenter, Dan O'Bannon, Brian Narelle and Jack Harris, a picture gallery and the aforementioned trailer. A serious omission from the release is a Carpenter commentary, which normally makes for great listening on his other DVDs. As this is called a "Special Edition" we could also have done with some interviews about the making of the production. As I received only a check disc for review I can say nothing about the packaging. In conclusion then: if you have a dark sense of humour you might enjoy this. If you're a fan of Carpenter's early work you'll love it. Red Dwarf years before its time. Bombed-out in space with a spaced-out bomb!